The Pata, a straight sword with a gauntlet integrated as a handguard and with a transverse grip, is the unique for use and the most difficult for learning among Indian weapons. Its uniqueness is manifested in the possibility to use not only both edges but also both flats with all the force and with the maximum possible ways. The blade can move continuously at a closed trajectory as well as change the direction of motion to the opposite without any additional preparation. For this kind of weapon the definition “the sword is extension and part of hand” is not just a metaphor. The difficulty in learning to use the pata is the need in all the previous successfully studied skills: use of the staff, the spear (not stubbing, only chopping), the tulwar and the baneti (stick with two weights on the both ends). Also for understanding the basic principles of this weapon, in the first place one needs to acquire a simpler technique with a training pata that has a flexible blade, which can bend into a ring. 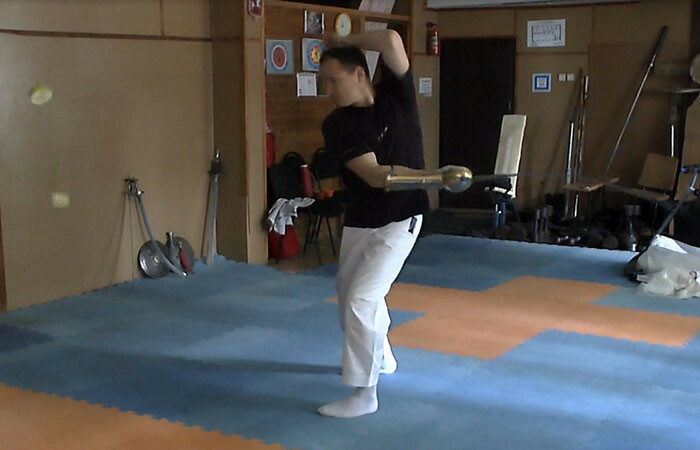 That allows not only to feel how to use the flat of the blade, hitting harshly to make the flexible blade get straight and firm, and understand the key principle of using the pata that is to use the third part of the blade (the nearest to the tip) like one’s own wrist while the wrist itself is immobilized in the gauntlet. That is why the pata allows to do the maximum number of useful motions easily like the human wrist and that is why the pata is a real “extension of hand”.